Founded in 1899, Hibon was a small cycle and gear manufacturing company. Thirteen years later, the company built the first rotary vane combustion motor which subsequently became a viscous liquid rotary pump. In 1945, Hibon was already one of the best specialists in the field. Hibon grew considerably and began to strengthen its international presence around 1960. At that time, Hibon was already the sole supplier worldwide of special cryogenic blowers for liquid propane gas (LPG) carriers. In the early 80’s Hibon acquired a Canadian company which later became Hibon Inc.
Today, Hibon operates as part of Ingersoll Rand. Through the acquisition in 2006, the company’s technological and geographical range has considerably widened. The company has full engineering capabilities with drafting and design computer stations, software selection programs and an automated test bench certified to ASME PTC 9 and ASME PTC 10 standards. By meeting ISO 9001 standards, the company has been able to open a new and larger manufacturing facility to meet increased production demands. The company has gained a strong foothold in high technology areas with markets such as food, chemical and the environment. To satisfy all foreseeable requirements in applications involving air or gases, Ingersoll Rand Hibon offers vacuum and low-pressure users an alternative to rotating piston boosters and turbo compressors. BOC Edwards Hibon allows you to choose from a wide range of high-performance solutions that satisfy the diverse requirements imposed by the operating constraints of various types of use. 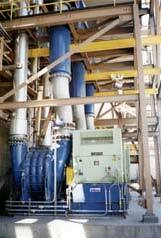 Thus, the chosen fields of use for multistage blowers include any application where there is a great need for variable flow at constant pressure. Indeed, by their very operating principle, these blowers naturally give variable flow and power at constant speed. Ingersoll Rand Hibon Blowers have been specially designed so that air flow can be regulated while pressure is kept constant, simply by adjusting a valve located at the intake. Thus, the power used is directly proportional to the mass flow that is called for. These blowers are selected on the basis of maximum temperature and pressure characteristics. Their performance follows the flow-pressure curve, allowing for a broad range of use without pumping: up to 50% of flow. This makes these blowers a very simple, low-cost, silent solution. Ingersoll Rand Hibon Blowers satisfy the strictest industrial criteria for vibration, noise, and efficiency. In continuous use, they can deliver clean, dry air at rates of 850 to 45,000 m 3/hr without pulsation, for pressures up to 1 bar (effective) and vacuums reaching 500 mbar absolute. Depending on pressure requirements, 5 to 10 stages can be mounted for different machine sizes. Ingersoll Rand Hibon offers a complete range of Positive Displacement blower, two and three lobes construction for water and wastewater applications, industrial pneumatic conveying and process air. The unique design of the blower offers low noise and pulsation, robust 5 bearing and oil lubrication for smooth and long operating life. ngersoll Rand Hibon distributes product all over the world. Our Montreal office is responsible for markets in North and South America, which includes Vacuum Trucks, Water and Wastewater, Industrial air applications (combustion air, desulphurization, pneumatic conveying). Ingersoll Rand Hibon is currently targeting the following areas for more involvement: Japan, China and other Asian countries.